TL Viewer is a versatile software for working with STL files. In addition to STL, it supports more than twenty popular 3D formats including STP/STEP, IGS/IGES, SAT, OBJ and allows converting them into other formats such as DWG, OBJ, JPG, etc. A significant feature of this viewer is measuring 3D models. The panel Structure shows the file content and properties of the measured object: its overall dimensions, volume and center of mass. By using this panel users can control visibility of 3D models' parts and save separate parts as DWG or DXF format. Easy-to-use measurement tools permit users to get more detailed information: area, height between two parallel surfaces, distance between two points, length of an edge and radius of a circle or a circular arc. The results of measurements are displayed in the special panel and are also added above the drawing. The dimension text can be moved, hidden or deleted. The drawing with all measurements may be printed or saved as BMP format. 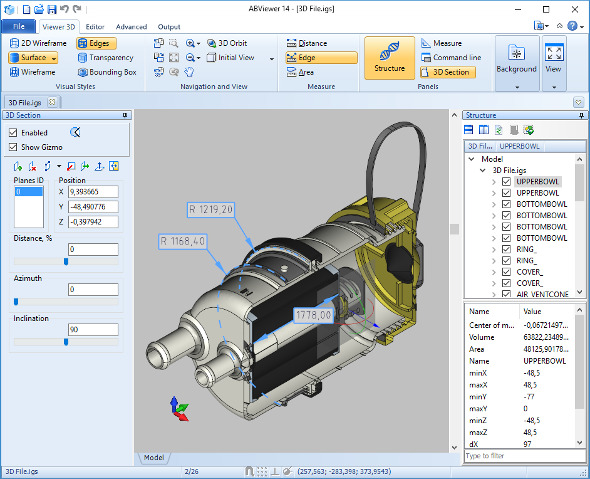 STL Viewer gives an opportunity to work not only with 3D, but also 2D CAD formats: DWG, DXF, HPGL, SVG, CGM and others. With the help of STL Viewer the work with 3D files will be much easier and efficient!